PennsylvAsia: Asian-American rapper+actor Awkwafina at Pitt, February 24. Asian-American rapper+actor Awkwafina at Pitt, February 24. 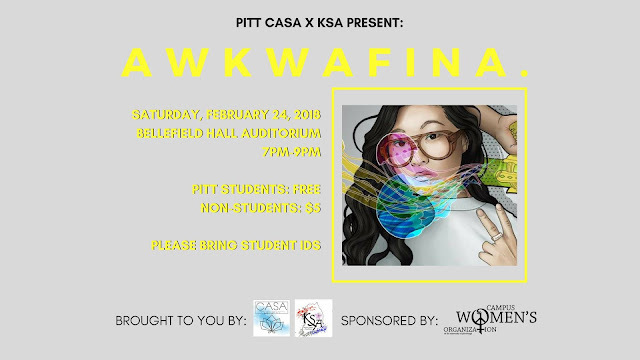 The University of Pittsburgh's Chinese American Student Association and Korean Student Association are bringing rapper and actor Awkwafina to Pitt on February 24. Come out to hear her speak, Q&A, and a meet and greet! Nora Lum, better known as Awkwafina is a Chinese-Korean American rapper, comedian, television personality, television host and actress. She works to break down barriers in both rap and Hollywood scenes. Awkwafina touches on many important issues surrounding mental health, cultural identity, feminism, and Asians in media. Her most upcoming appearances will be in Crazy Rich Asians (2018) and Ocean's 8 (2018). To RSVP fill out this google form! SEATS ARE LIMITED AND FIRST COME FIRST SERVE! The event is free for Pitt students and $5 for everyone else, though registration is required. The event is at Bellefield Auditorium (map) and the doors open at 6:40 pm.